BuySomeBitcoins.com has been acquired by SIFR ltd.
Have you looked into buysomebitcoins.com lately? Are you looking for a new source of Bitcoins? It is always nice to have a handful of choices when it comes to having a list of websites on where you can acquire Bitcoins from. The “list” I kid you not can go as long as you can imagine! Having the right set of choices would come in handy especially if these sources you have would encounter “inventory issues” like some of the Bitcoin exchange websites are experiencing right now. It is always nice to see new websites coming into the bitcoin exchange scene as this means more choices for us! And of course, that means that the market is growing. Amidst all the choices we have today, around 20% (personal estimate) can be a potential scam website, especially the ones new to the scene. Today we are going to look further into buysomebitcoins.com, are you familiar with them? I did some digging and found out a couple of things that you might want to know about them as well. They have been operating since 2016, fairly young in the industry if you ask me. Their website says that they are registered as “IBLIS Entreprise Limited” and is headquartered in 27 Old Gloucester Street, London, United Kingdom, WC1N 3AX. They also have an MSB registration which you can check here. Just enter “BUYSOMEBITCOINS” on the DBA NAME search box and hit search on the bottom part. Well now it would be best to have a name behind the company, would it? Unfortunately, I was unable to verify or locate one for you. For our readers that have any idea on who is behind this website, please do share it in the comments section, thanks! I entered my phone number and got a confirmation right away! I entered the 4 digit confirmation number on the website and about a few seconds, I was registered. You will then be redirected to the homepage that you are seeing on the screenshot above. You would have the buy/sell Bitcoin buttons on top and the verify identity and ads below. To verify your account, you need to grab a piece of paper and write down the example provided above. It simply says your name and how you authorize buysomebitcoins.com to charge your debit/credit card for the purpose of any charges and fees related to your account. 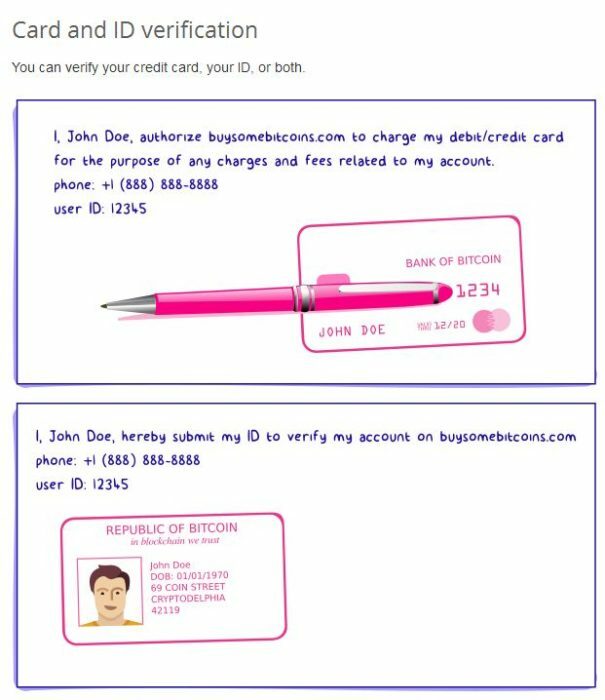 After you have written it down on a piece of paper, get your ID or Credit Card and take a photo of it using your smartphone or tablet then attach the photo to an email and send it to go@buysomebitcoins.com. Please be advised that you are not required to submit both identifications to get verified. You can either submit your ID or Credit Card, or you can do both. Verification level would depend on the amount of information you are willing to provide. This would also come in hand with how much you would get in return in terms of perks. For our readers that are having second thoughts in providing sensitive information over the internet then I suggest not to do this part. Only proceed if you are willing and confident with any website out there asking for your personal information. They do however claim that they store personal information offline, but still, it would be best to be careful at all times. What do you in having your account verified? Good thing that buysomebitcoins.com shared this document regarding the limits of an unverified account against the verified one. On the top part of the pricing table, you get your limits. 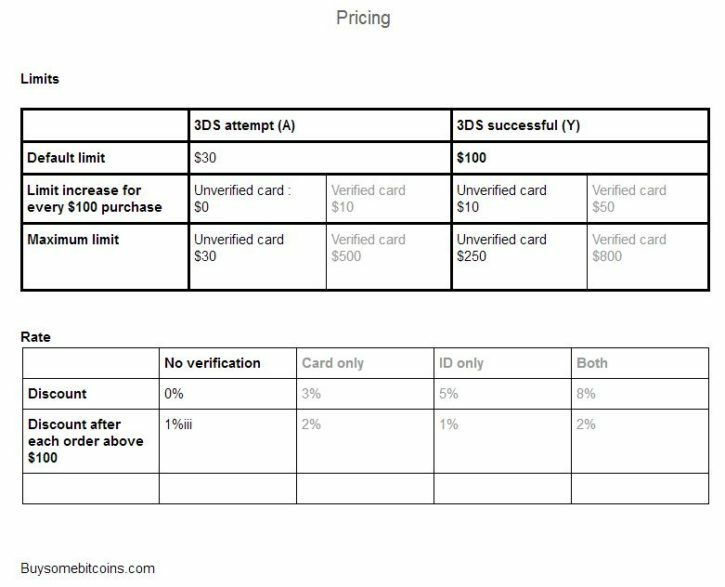 Default limit, Limit increase for every $100 purchase and your maximum limit per card. What are 3D Secured Attempt Cards? These are cards that haven’t gone through a security upgrade through their bank. If you are unsure of what this is, better call your bank and ask more about it and request to have this upgraded. To add an additional card to your account all you need to do is log in and on the right-hand corner of your homepage, you can see the “+ Add new card button”, just click on it and add your new card. Currently, buysomebitcoins.com only accepts payments from VISA/Master Cards worldwide. They are also planning to bring in third-party payment platforms like PayPal in the future to cater different audiences. The website is plain and simple. I think they aimed for simplicity here as they did really hit the bulls-eye on that one. 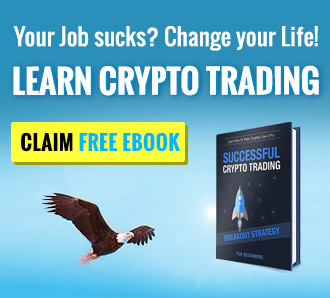 When it comes to Bitcoin exchange websites, you do not need to have charts and graphs showing everywhere as visitors would just come and go at any given time of the day. They wouldn’t stay around that long enough to actually notice how the website is designed. Customer Support, the most important thing that a Bitcoin exchange website should have. And they seem to be lacking it? Yes, on the home page of their website it shows that they cater 24hr customer service. I, however, do not see a direct button to email them when logged into my account. They do have an email go@buysomebitcoins.com and mobile number posted. You can call/text them directly at (302) 365-0207. They also offer commissions every time your referral makes a purchase. You would get 15% for every purchase. Buysomebitcoins.com is a fairly new exchange and the reviews posted online are not genuine as they offer a good 15% referral bonus. Proceed with caution and always do research.